The Park family settled into their Golden lifestyle in December 2016 after Jeeyong Park accepted an opportunity to work a one-year contract at the Colorado School of Mines as a Research Engineer. Jeeyong along with wife, Hyeonah Shim and outgoing six-year-old son, Ryan moved from Seoul, South Korea and quickly grew fond of their new community, nestled among the foothills of the Rocky Mountains. As the Parks’ explored their new town, they discovered there was a lot to love, not only as first-time visitors but also as yearlong residents. Their appreciation stemmed from the mountain trails and nearby hiking with daily sunshine and beautiful clear skies. 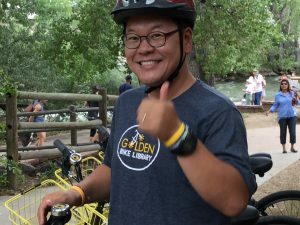 The family used resources such as the websites for Visit Golden and the City of Golden to find information on upcoming events, which is where they first discovered, and were immediately drawn to Golden’s bike share program known as the Golden Bike Library. Differing from traditional bike share programs, the “library” has a variety of bikes available for different ages and abilities, including road bikes, mountain bikes, children’s bikes and lightweight geared bikes. The library easily offered enough variety to uniquely equip each member of the family. 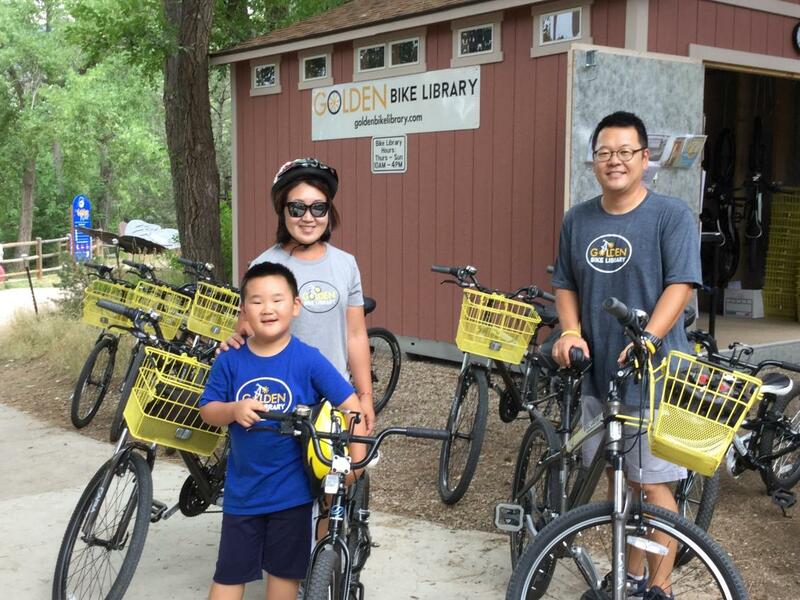 The Golden Bike Library, opened for its second season in April 2017 and the Park family soon became the most frequent patrons and most loyal riders. The family has rented bicycles nearly every single day the Golden Bike Library is open which has made it convenient for the Parks’ family to get around town and attend many of Golden’s weekend events and festivals, including First Fridays and the Golden Farmers Market. 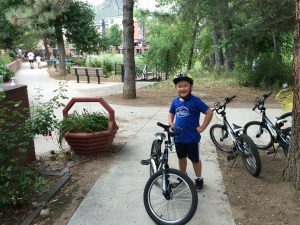 Riding bikes through Golden is one of the family’s favorite activities to do together. It was a rare occurrence for all three family members to be able to bike at the same time in South Korea. Their previous experiences riding bikes were often crowded along the busy streets of Seoul. The family of three agrees that Sunday is their favorite day to rent bikes because it is the best time to enjoy biking in Golden’s because of the weather, scenery and people. In fact, the Parks’ have witnessed numerous types of wildlife along Clear Creek Trail. Their son, Ryan is often excited to share his experiences seeing snakes, squirrels, rabbits and deer. He also looks forward to renting from Golden Bike Library largely due to Craig Berkley and Carl Neidert, the friendly operators of the Golden Bike Library. They have become very familiar faces to the Parks’ during their 20+ rental experiences (and counting)! Craig and Carl greet their Golden Bike Library patrons with smiles and cheerfulness, which has made the Parks’ especially grateful to have local acquaintances who recognize and remember their names on a daily basis. “We are thankful that Craig and Carl have remembered our son, Ryan’s name even though we’re only here for a short period of time,” Hyeonah Shim said. 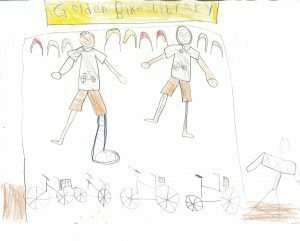 Ryan even took the time to draw Craig and Carl a picture after missing one day of riding but luckily, he still has plenty of time to continue enjoying renting the bikes with his parents before the family returns to South Korea later this year because the Golden Bike Library will operate through October! The Parks’ have been looking forward to continuing their family rides through the fall because it’s the perfect time for family bike excursions through beautiful downtown Golden. Crisp autumn air, changing foliage, the sounds of clear creek flowing and the crunch of the leaves beneath the tires is enough to put anyone in the mood for the 2017 Fall Brewery Tour by Bike! You just might spot the Park family along the way! Rent one of the bikes with the yellow baskets and start your own Golden adventure. Don’t forget to ring your bell to give a Golden greeting as you pass! 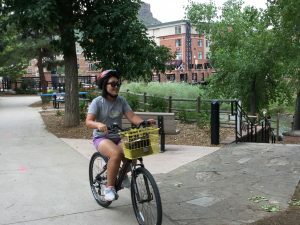 The Golden Bike Library is located outside the Golden Visitors Center along Clear Creek. Open Thursday – Sunday, 10 a.m. – 4 p.m. Costs are $10 a day and are free the first 2 hours!